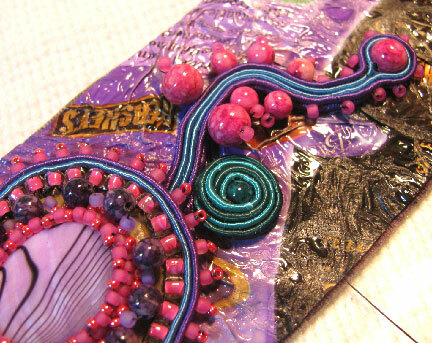 Beading Arts: Textured Surfaces...a new chapter for Bored By Back Stitch! 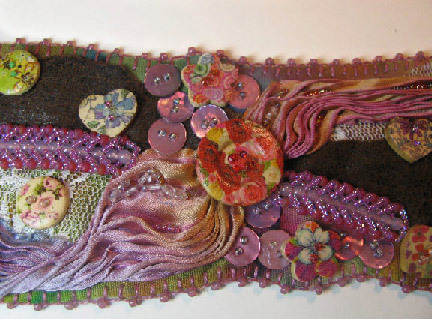 Textured Surfaces...a new chapter for Bored By Back Stitch! Bored By Back Stitch now has a third, and final, chapter! Introducing Textured Surfaces! First we turned the most popular bead weaving stitches into bead embroidered motifs and explored ways to combine those stitches into more complex designs, so now it seems only logical to turn our attention to other ways to add texture to our beaded wearables and non-wearables, to add some new stitches to the repertoire, and to try out four new bracelet projects too! Because of the textural complexity of the beaded stitches, it often seems sensible to leave larger areas of the foundation unbeaded than is the case with purely back stitched designs. Therefore, we're going to want to make sure the foundation surface is interesting to look at as well! 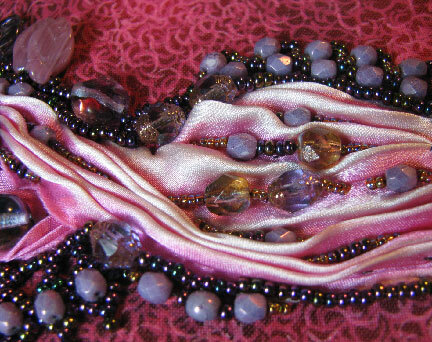 I want to introduce you to four materials that are beautiful and interesting to look at on their own, and that play very well with beads, as we shall see: shibori pleated silk ribbon, metal mesh ribbon, soutache braid, and chocolate bags. Chocolate...? Say what? Oh yeah, just wait! If you've never worked with these materials before, here is the guide to get you started. There are step-by-step instructions for the new stitches and the projects, but you'll need to refer to the very basic Stitch Reference I included in Chapter One (page 97) for the rest. 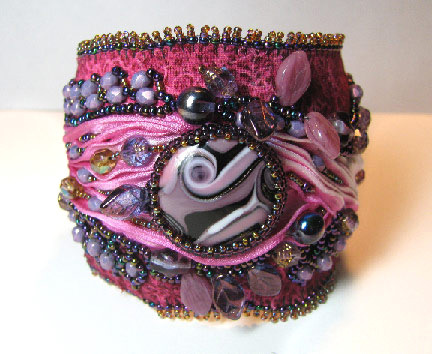 Besides the Stitch Reference, you may also need to download the free first chapter of Every Bead Has a Story if you haven't already done so, which shows you how to do basic bead embroidery stitches, add the backing fabric, and finish the edges of your pieces. So let's get started! When have you ever before had such a good excuse to eat more chocolate? Congratulations of finishing the book, Cyndi. These textured surfaces make me just want to reach out and finger them. They're gorgeous! Fabulous! I love texture and am just starting beading. Will have to check out the chapters of your book.